A Samsung washer dryer will make laundry day less of a chore as there’s no need to hang your washing on a line. Samsung washer dryers can take care of your washing from start to finish, meaning you have less work to do. 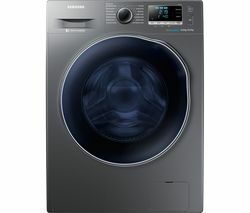 Samsung washer dryers can handle heavily soiled clothes and tough stains. And because they’re fully programmable, you can adjust the settings to match what you put in the machine. Choose a short wash for lighter loads, as it’s more economical and uses less water, so there’s less impact on the environment. When laundry day comes around, the last thing you want to do is extra loads, so if you’ve got a big family or regularly have to wash larger loads, choose a Samsung washer dryer with a higher capacity. Samsung washer dryers use Samsung ecobubble™ technology to gently but effectively clean your clothes and effortlessly remove notoriously difficult stains such as wine, blood, chocolate and grass. If you’re looking for an affordable washer dryer that can handle tough stains, check out our collection of Indesit washer dryers and if you’re after an iconic washer dryer that will look great in your home, take a look at our Smeg washer dryers. 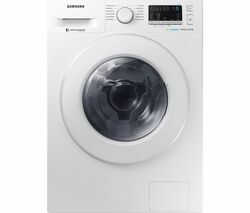 If you’re looking for an efficient washer dryer that uses less energy to clean your clothes, a Samsung washer dryer is ideal.